Almost three quarters of the entire Valencia Region is made up of limestone, which promotes the formation of cavities as a consequence of the processes of dissolution of water as it filters into the earth. Caves are particularly interesting from an environmental perspective, which is why they are provided with special protection in the Valencia Region and they are considered to be protected natural spaces. The variety of caves includes caves of a touristic nature: Coves de Sant Josep at the Vall d'Uixò, which are navigable on the inside, Cueva de Don Juan in Jalance, Cova del Rull in the Vall d'Ebo, the Cova de l'Adsubia, the cave of Canelobrein Busot or the Cueva de las Calaverasin Benidoleig, as well as the ones you may visit thanks to expert spelunking guides. 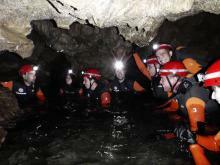 Active tourism companies spread around the Valencia Region provide you with the opportunity to delve into the wonderful and surprising world of spelunking, based on respecting the fragile natural environment of these spaces and with the necessary safety measures required to carry out these activities.